What is a Remand House? Who are the Bound Men and Bound Women? What makes them different from the Lords and Ladies―and why are they the eternal slaves of pain? They are human beings. But their world―their weirdly logical but not-sane world―is isolated in time and space, and totally insulated from humanity as we know it. It is a world where suffering and torture are essential to the maintenance of civilization. But Bloodworld can not be described in a few brief words. To understand it, you must read this unique book from its first searing words to its violent and all-important last page. It is a science-fiction novel with a difference. And it will shock you as only a vital, living thing can shock. Good lord, jacket copy, you think you could try to play this book up a bit more? How about calling it unique and different a few more times to see if perhaps the idea sinks in? Maybe in 1965 this book would have been considered shocking. I wish I knew. All I can really say is that now, in 2017, it’s definitely…not. While the novel does stand out in a lot of ways, I can’t honestly say that it did anything to surprise me deeply. In fact, the jacket copy makes it seem like I ought to have been clinging to the book, both fearing to turn to the next page while not being able to stop myself. Truth is I didn’t feel that way at all. While this was certainly not a bad book, it was yet another one that totally failed to grab my interest more than, say, a good nap. And it was a good nap. Boy howdy. I feel like I also did some other things to distract myself from finishing this novel, but I can’t remember any of them. Even when I finally got around to sitting down and reading, it took just forever. This book, a short 160-pager, took me all day to read. Even sitting down to review the thing took some work to get around to. I took an hour to go back through all the past reviews on this blog and add dates and decades to the tags, which means that you can browse via those things now. I apparently really love the 70s. 1978 in particular. Here’s a fun fact: When I first started this book I didn’t know about the naked lady on there. The sticker from McKay Used Books covered her up entirely. I thought the art was just a nekkid dude with a whip who was, I guess, mad at that orange planet. Then I pulled the sticker off to scan the cover and was just OH NOOOO THIS COVER IS REALLY NSFW. Sorry about that black spot on the planet. That was there when I bought the book. I wanted to edit it out but it turns out I’ve got no skills at that. The artwork is quite appropriate to the text, which is surprising but might make someone think that the text will be extremely problematic. But it turns out that the book is less problematic than I was anticipating! Sure, it’s got some stuff that is potentially triggering to some people. I get that. But it turns out that a lot of the point of this book is presenting a culture that’s vastly alien to us, the readers, and doing so from the point of view of someone totally enmeshed in that culture, someone who thinks that this culture is right and just and proper. That someone is Jo. He’s the first-person narrator of this little culture study, and he’s from…um…a planet? I don’t think the planet was ever actually named? That makes sense, though. 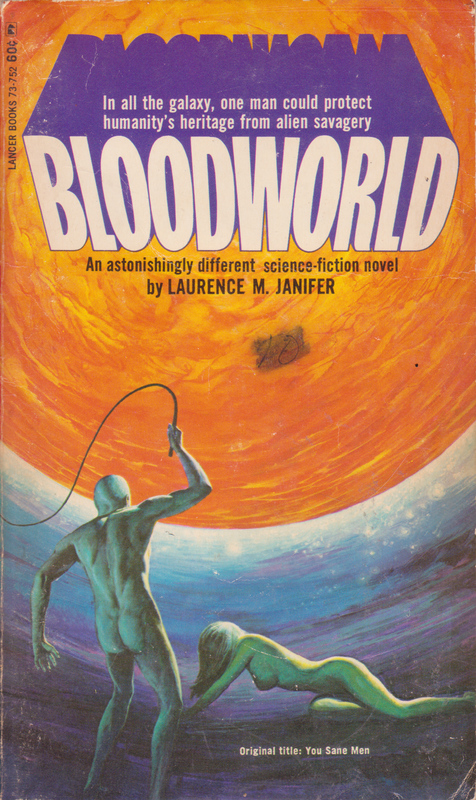 Laurence M. Janifer―1960 Hugo nominee and frequent collaborator with Michael Kurland and Randall Garrett, among others―did his level best to present us with a narrative told from the point of view of someone who doesn’t feel the need to exposition people on every little detail of his life. Jo knows what the name of his planet is. The fictional audience to whom he’s writing presumably also knows. So why mention such basic information? He likewise doesn’t mention his own name until fairly deep into the book, which was both praiseworthy and a little annoying for someone who needs to review the damn thing later. I called the book a culture study and I’m gonna stick with that, even though there’s also a bit of a plot. The plot’s pretty barebones and almost not worth mentioning. I feel like it was perhaps thrown in at the demand of the publisher. The culture of Jo’s world, which has been cut off from the rest of galactic human culture for a long while, consists of some things that we, the reader, might well find disgusting. Jo thinks of these things as normal. He spends a good deal of the book pleading with his imaginary audience of sociologists and doctors for whom he is setting this down to not judge him for the beliefs he grew up with. Jo makes for an interesting narrator. The narration is the book’s greatest strength. Jo is constantly referring to his readers as “You doctors, you sane men, you normal human beings” in a way that might be obsequiousness or might be sarcasm. Probably both, or one masquerading as the other. It’s hard to tell, and Jo makes for the best unreliable narrator I’ve experienced since Humbert Humbert. Jo’s culture is divided into two strata: the Lords and Ladies, and the Bound Men and Women. The Lords and Ladies are the free people. They run the place and do the administrative work, skilled labor, and so on. The Bound Men and Women are slaves who live in places called Remand Houses. They do some grunt work, but their main duty is to be tortured. Torture is a respectable emotional outlet in this culture. It’s real torture, too, not some kind of trick. The Bound People aren’t some kind of willing subjects who get something out of it too. There are men and women whose entire lives exist solely to be unwillingly beaten, burned, mutilated, and so forth. The book never suggests that its possible to go too far with it. It also never mentions what happens if a Bound Person is killed by a Lord or Lady, or if that ever happens. I imagine it would be of little to no consequence. And so here’s the thing. This culture has very little violence in it outside of this sanctioned and utterly horrifying custom. Murder is unheard of. Fights and arguments are uncommon. People get their aggression out, and society is free and safe. All it takes is the subjugation and sadistic torment of other human beings who are born and bred into that life with no means or hope of escape from it. I want to make it very clear, just because I know I have to what with the Internet being what it is and the times in which we live, that I do not and would not condone that kind of behavior. I do not suggest that this would work in real life. I don’t think it’s a good idea to try. Nothing about this setup is in any way appealing or justifiable to me. But that’s the point! This is a science fiction novel, one doing what science fiction can do best: presenting us with something abominable and forcing us to look at our own reflections in it. Everyone wants a safer society, right? So to what ends should we go to ensure that? If 99% of people can live in complete harmony and bliss at the cost of 1% of the population living in abject horror, isn’t that worth it? Very few people would say yes, but why isn’t it? Isn’t that a net gain for society? If that’s not acceptable, what is? How far can we go? Is it okay for cows to live in misery so that we can all have delicious beef? Is that too far? Is it okay for us to burn down the homes of our neighbors on this planet, animals that share 99% of their genetic code with us, just so that humanity can build chairs? That’s what this book is implicitly asking. We know what’s over the line, but where’s the line? Wouldn’t it be nice if we could figure that out? There’s other stuff going in the book, but I think it’s only there because otherwise it would have been too short to publish. For one, there’s a murder of a Lady, and all of the possibilities surrounding that murder are impossible for anyone to imagine. Either a Bound Person did it, another Free Person did it, or an invader from space did it. None of these are possible, insofar as anyone in this society is concerned. Jo gets tasked with investigating the murder, which takes a back seat for a lot of the book. A few more people get killed as things go on, and it’s all about the same there. Perhaps more important is that there is a rebellion brewing. Jo gets caught up in a plan to overthrow the Council, which governs his city. Jo himself will be on the Council one day, as both his parents have been, and he’s not actually super keen on the idea of overthrowing it. He basically gets peer pressured into it. See, on Jo’s world, every Free Person serves on the Council for a time. It’s a rotating group of people who each serve for a three-month term. The positions are staggered so that new people come in every month. The rebels’ concern is that young people are not represented by the Council. Jo and his generation are all too young to currently serve. Some people think that’s not fair, and that the Council consists only of Old People who focus on the concerns of other Old People. It’s time for new blood, they argue, and they’re going to use whatever means it takes to get what they want. I feel like maybe that’s a little topical. Of course, we’re supposed to think that this rebellion and the murders are connected, but in the end, it turns out they’re not really. I guess you could say they’re connected in that they have similar causes, but that’s about it. The rebels didn’t do the original murder. Later, though, they do a lot of murder. The last plot hook is that Jo is in love with a Bound Woman. Her name is Elaine. Their love is forbidden, as you might expect. Jo wants to get Elaine free somehow, and it’s a decent bit of characterization as we come to realize that Jo doesn’t give a crap about Bound People and their plight, he just wants Elaine free because he loves her. At least, he keeps telling us he loves her. The rebellion finally shows up and Jo and his pals all run around burning things down and killing old people. Society completely collapses, which brings us the revelation that society is the reason that this whole rebellion happened in the first place. See, the folks behind it aren’t really interested in social change, they’re more interested in murder and destruction. But I thought that was supposed to be taken care of by their brutal mistreatment of Bound People? you might be asking. Well, that’s relevant. See, it turns out that the Bound People are slowly becoming more and more accustomed to their lot, and they’re just not as much fun anymore. That violent satiation just isn’t enough. Lots of people are realizing that you could have a lot more fun murdering and violating people who don’t want it and think that it’s impossible for it to happen to them. I’m sure there’s a message there, too. I’d say the sixties were messed up, but saying that in the year 2017 is pretty damn laughable. In the chaos, Jo and Elaine manage to escape to a space ship, one of the ancient ones that brought their ancestors to this planet generations ago. They leave the planet, only to be rescued by representatives of the government to which is he now writing this report. The final revelation of the book is that the murderer―remember the murderer?―wasn’t one of the rebels at all, but was, in fact, Jo’s mother. I dunno, that wasn’t the book’s biggest strength. Honestly, I think that without, um, most of the plot, this book would have been better. I know that most people wouldn’t want to sit and read an analysis of a culture without any real story to it, but I’m not one of those people. I’d be fine with it, if it meant avoiding a tacked-on plot that didn’t really fit anything and made me seriously wonder what the point of it all was. See, it distracted from the real point, which was to make us question ourselves and our moral decisions. All the other fluff didn’t really help that goal, and so I wasn’t thrilled with it. I might be wrong, though. I did fall asleep while reading, and found myself easily distracted the whole time. While I totally respect this book on a lot of levels, I have to say again that I found it difficult to read for reasons that I’m completely stumped about. The best I’ve got is that something about the tone or narrative structure clashed with the way I process information. I’ll be a big man and take half the blame here. I’ve passed on this one at a used book store before – looks like I made the right choice.